“The Prophet And His Times”: the journey of a man from nothingness to providence and prosperity. 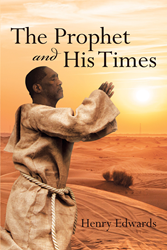 “The Prophet And His Times” is the creation of published author, Henry Edwards. Apostle Henry Lee Edwards was born on July 10, 1946 in Thula, Mississippi, but grew up in Robert Taylor, K Town and on the South Side of Chicago. As a young man, Henry attended Bond Elementary School, but never completed sixth grade. Instead, he was sent to jail at the suggestion of his mother, because she was fearful that he was going to fall prey to gangs and violence. He has been married to Diane Edwards for thirty-five years. They have ten children together. Henry lives in Englewood where he has his “church without walls.” He founded “We Need to Hear from God Outreach Ministries” in 1992. He mentors youth who are being influenced by drugs, gangs, and violence as well as youths and adults serving sentences in the prison system, including those who are working toward reentry into society. He provides stipend jobs, such as grass cutting, snow shoveling, and car washing. He is especially proud of Aaron Pinkston, who had served a thirty-five-year sentence and has been released in 2015. Henry deposits positive messages into the minds of youth on a daily basis, so that they can have a chance at life. In 2016, the City Council of Chicago, Illinois and Raymond Lopez, Alderman of the 15th Ward, recognized Apostle Henry L. Edwards for his accomplishments and contributions to the City of Chicago. Apostle Edwards is known for his generosity. He often provides groceries, clothing, and rent money to struggling families from his personal funds. He is the pastor of the “block,” known as the “Rev,” a preacher man who will pray for and encourage his community members whether they are members of his church or not. Published by Christian Faith Publishing, Henry Edwards’ new book is the story of a servant committed to his faith. “The Prophet And His Times” is about a Twenty-First Century prophet God anointed to live by faith. Once lacking material goods, he had only himself, his family, and God. He was chosen to live this way. There were many who said that it could not be done, but Apostle Henry Edwards proved that it could be done through his faith walk. shall live by faith.” God was teaching Apostle Edwards how to live according to faith and belief in Him. It was not an easy journey, but it was a worthwhile one. View a synopsis of “The Prophet And His Times” on YouTube. Consumers can purchase “The Prophet And His Times” at traditional brick & mortar bookstores, or online at Amazon.com, Apple iTunes store, or Barnes and Noble. For additional information or inquiries about “The Prophet And His Times”, contact the Christian Faith Publishing media department at 866-554-0919.